(CNN)A maritime blunder then a ruinous rescue attempt has left a multi-million dollar warship under NATO command almost entirely submerged in a Norwegian fjord. The frigate, one of five in the Scandinavian country's navy, had been moving around inner fjords in western Norway for navigation training before it collided with the 250-meter long tanker (820 ft) that was sailing out of an oil terminal. Now all that remains above the waterline is the frigate's top, antennas and radar, leading local media to speculate how a ship designed for war failed to avoid a slow-moving 150,000-ton tanker. The KNM Helge Ingstad pictured on November 10, 2018 in the Hjeltefjord near Bergen. 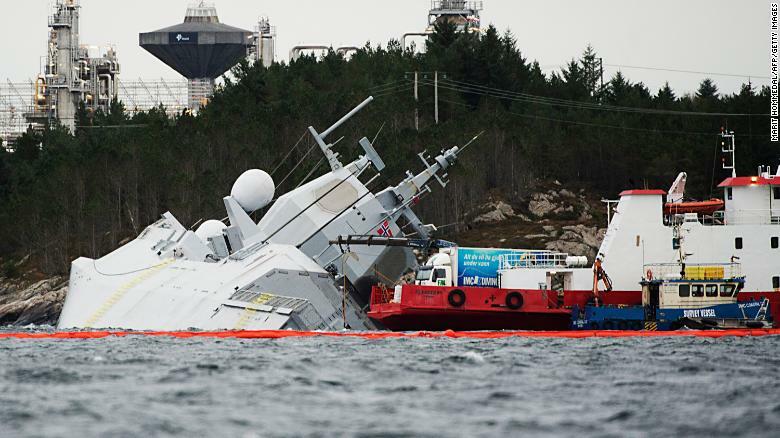 The frigate, which was returning from NATO's Trident Juncture exercises, was evacuated after the collision with the Sola TS tanker, Norway's army said. Norway's military has remained tight lipped about the situation, which injured eight of the 137 people on board. Navy communications officer Torill Herland told CNN that whatever occurred during the accident near Bergen is now "police work." Similar cases involving US Navy destroyers over the last two years were found to have been down to avoidable errors, according to Alex Pape, Editor of Jane's Fighting Ships, but he said it is too early to speculate on this incident. "Warships, particularly surface combatants like frigates, are generally designed to withstand a degree of battle damage," Pape told CNN. "However, even for well protected warships, if they sustain sufficient damage, particularly in adjacent compartments and below the waterline, the resulting flooding may be too much for pumps and/or the crew's damage control efforts to cope with, and the ship will list, capsize or sink. Jan Vindenes is the general manager of Sotra Anchor & Chain, whose products have been used in numerous shipwreck recoveries, including that of the Costa Concordia -- the cruise ship which crashed into rocks off the coast of Italy in 2012, killing 32 people on board. He thinks chains could have been used to secure the frigate. "They used some wire to secure the frigate but unfortunately it snapped. We say that chain is stronger and better than wire." "We have chain that can hold 2,000 tonnes, and our chain was used to raise the Costa Concordia, which was very much bigger than this frigate" he added. Given that the frigate is one of only five operated by the Norwegian navy, its loss is likely to impact on national and NATO operations. But the country's military will have to carefully consider the cost of salvaging and repairing it for active service. Pape told CNN: "Curiously, if the ship is not repaired, the reduction of one ship that needs to be maintained, upgraded, manned and used over the remaining 20 years of its life will mean that cost for the navy could go down in the long run, however with a loss of capability." Pape estimates that a decision to salvage it, repair it, and return it to service would cost hundreds of millions of dollars. "The total cost could be similar to the cost of a new ship." The financial impact of the crash is likely to be felt well beyond the military, as it triggered the shutdown of a North Sea crude export terminal, Norway's largest gas processing plant and several offshore fields. Fortunately the oil tanker -- which was carrying almost 100 million liters of oil -- was not seriously damaged in the accident. The Norwegian Coastal Administration said it had cleaned up some diesel and helicopter fuel that was spilled in the incident, but that has been largely contained, according to Truls Gulowsen, head of Greenpeace in Norway. "A major leakage would have constituted an unbelievable environmental disaster that easily could have impacted most of Norway's western coastline," Gulowsen told CNN. Gulowsen added however that, "the situation is not yet stable and the vessel is still under water. The frigate had additional 385,000 liters of marine diesel, but this has not leaked,"
The Norwegian Navy is now considering ways to raise the vessel, according to the military's chief of staff, Admiral Nils Andreas Stensones. "It's very hard for a navy to lose a vessel," he told AFP.